The UK's car scrappage scheme is to be extended, Lord Mandelson has announced. He said "we cannot do everything but that does not mean doing nothing" and said the scheme would be extended to cover 100,000 more cars and vans. The £300m initiative had been due to end in February, or when the limit of 300,000 vehicles being scrapped was reached. So far 227,750 orders have been placed through the scheme - which at a cost to the government of £1,000 per car means £227m has been spent. The extension means a total £400m will have been committed to the scheme, which will still end in February at the latest. Other modifications to the scheme will see the age qualification changed by six months to any car registered before 29 February 2000, and cut the minimum age of vans being scrapped from 10 years to eight years. 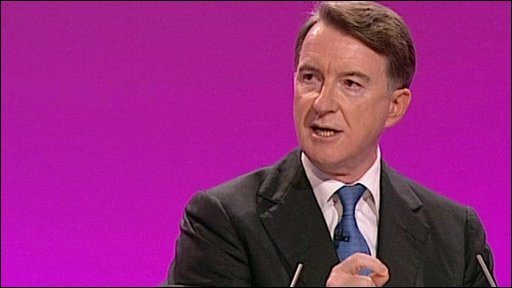 In his speech to delegates in Brighton Lord Mandelson said: "There are encouraging signs that the economy is picking up. But recovery remains fragile and uncertain, especially in manufacturing and one of its cornerstones, the car industry." He said: "This is not a blank cheque to the auto manufacturers but recognition that there is still a short term challenge to boost demand and confidence in the sector." The Society of Motor Manufacturers chief executive Paul Everitt said it was an "extremely important decision that will inspire consumer and business confidence". He added: "The additional 100,000 vehicles should help to counter the likely negative impacts of a return to the higher rate of VAT and the introduction of first year VED rates." Nissan's UK managing director Paul Willcox said the scheme had provided a "vital boost" to the car industry and they were pleased "to see that the Government has rightfully placed the car industry at the top of the economic agenda where it belongs". As well as announcing the extension of the scheme he pledged the government would "stand behind Vauxhall workers in Ellesmere Port and Luton where the workforce themselves have been the main driver of change. And the same goes for Jaguar Land Rover too". Unions and Labour MPs have been urging ministers to extend the scheme to help save manufacturing jobs amid concerns car sales would fall sharply without continued incentives to boost demand. Unite General Secretary Derek Simpson told the conference that extending the scheme was the kind of move which Labour must make to help "reconnect" with working people. And Labour backbencher Lindsay Hoyle said it was "important" the scheme was extended soon. Manufacturing associations recently wrote to Chancellor Alistair Darling about the "clear risks" of ending the scheme, saying demand for new cars would be hard to maintain without the incentives currently in place. The letter was signed by the EEF, UK Steel, the Manufacturing Technologies Association and British Plastics Federation. The 5bn-euro German scheme, the largest of any government, ran out early this month. It encouraged almost two million motorists to scrap their old cars and exchange them for new ones. The US version spent its $3bn allocation in a matter of weeks. The UK, US and German governments have spent a total of 8bn euros ($11.4bn; £7bn) on similar scrappage schemes.